In additional to Invisalign, Guildford Smiles Dentistry can discuss other orthodontics options with you, such as regular braces. Beautiful, straight teeth are nice, but eliminating the potential health problems associated with uneven teeth and a misaligned jaw is even more important. Misalignments can make it difficult to clean teeth, making your more susceptible to tooth decay and gum disease. Untreated orthodontic problems can also lead to chewing and digestion difficulties, speech impairments, and abnormal wear of tooth surfaces. Over time, the strain orthodontic problems can place on the gum tissue and bone that supports the teeth can affect the jaw joints, leading to problems like headaches or face and neck pain. With modern advancements in orthodontics, wearing braces has never been easier. Various state-of-the-art appliances and treatments are now available, from clear and tooth coloured brackets, to wires that are heat activated and require fewer adjustments. Active orthodontic treatment involves regular adjustment appointments with your orthodontist and adherence to specific treatment requirements. During this phase, the teeth straightening process will take place. 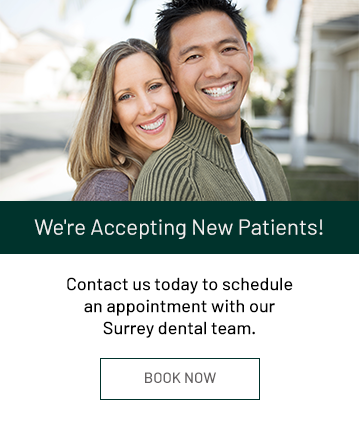 You will visit your dentist at designated intervals so that he can monitor your process, and if you have braces, make adjustments that allow you to transition to the next portion of the treatment phase. You orthodontist will give you specific instructions based on the type of orthodontic treatment you are undergoing. You will also receive instructions for cleaning and caring for your orthodontic appliance, and what types of foods you should and shouldn't eat during treatment. When the active treatment is complete, the braces and/or appliances will be removed and a retainer will be made. Retainers are usually removable and will maintain the changes made to your teeth when worn continuously until the teeth and bone are stabilized in their new positions. Invisalign vs. Braces: What's the Difference? Please contact Guildford Smiles today for an orthodontic assessment so that we can determine your treatment needs.